As much as I love to dress up for the holidays, I love it when I have the opportunity to dress down. If I do, I’ll do anything I can to stay cozy. The first thing I’ll grab is this buffalo plaid poncho. When I think of buffalo plaid, I think of the quintessential holiday print. Something about the checked pattern and red & black color combination illustrates the holiday season. This is usually the print I gravitate towards when I try to come up with a holiday outfit. Another reason why I think the buffalo plaid poncho is the best thing to wear during the holidays is because it is like a blanket that can be worn in public. If I could, I would love to be wrapped up in a blanket all day. Whenever I am home, a throw blanket is the first thing I grab before I plop myself on the couch. That extra layer on my body gives me that cozy and comfy feeling. Am I the only one that thinks a poncho is a walking blanket? Haha. Plus, wearing a poncho is so effortless. Just like a blanket, you just throw it on and you already look so well put together. I wore my favorite crewneck striped tee that I scored from the Nordstrom Anniversary Sale. This tee is so comfortable and the length is perfect. It is longer than your average tee, but not as long as a tunic. They need to make more tees this length because I don’t have to worry about them bunching up. It also has a little stretch to it, which makes it easier to move around and do whatever you please that day. Do you guys dress comfy or dress up with family during the holidays? I need a poncho like this to go through winter in France! Great look! 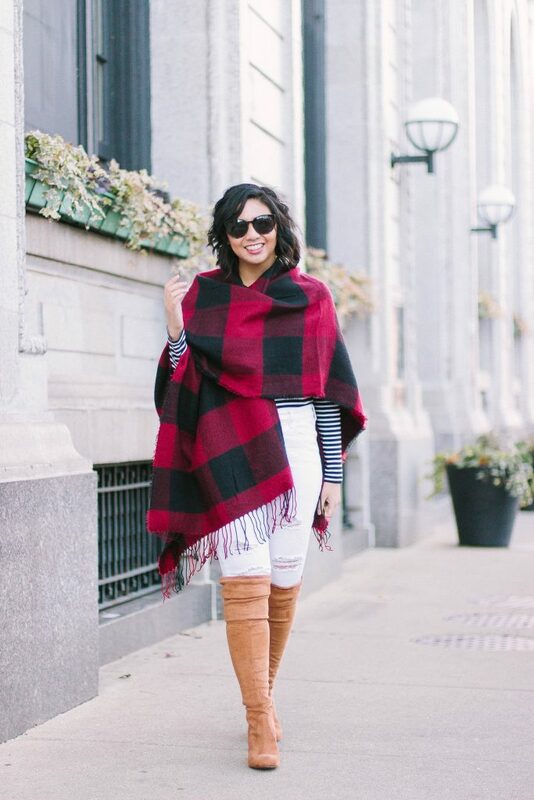 Love the warm, cozy plaid, it looks great on you! Ponchos are my favorite! So easy to wear! Thanks Ashley! They totally are! 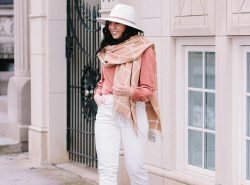 LOVE this and how you’re rocking white jeans in winter — so pretty! Loving your plaid poncho girlie!! Love it! 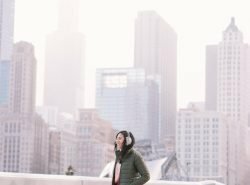 I’m all about cozy combos for the holidays and this is perfect. What I love so much about ponchos is how warm they are, yet how easy they are to remove — without messing up makeup and hair! Thank you Cheryl! And I totally agree! And it makes taking blog photos so easy haha! Plaid and stripes is my favorite pattern combo. It’s so festive and fresh! In love with your poncho!! Me rechiflan este tipo de prendas, los ponchos y las ruanas son tan calentitos. Buffalo plaid at its best you pretty girl! Love how you mixed and matched the patterns! So cute! 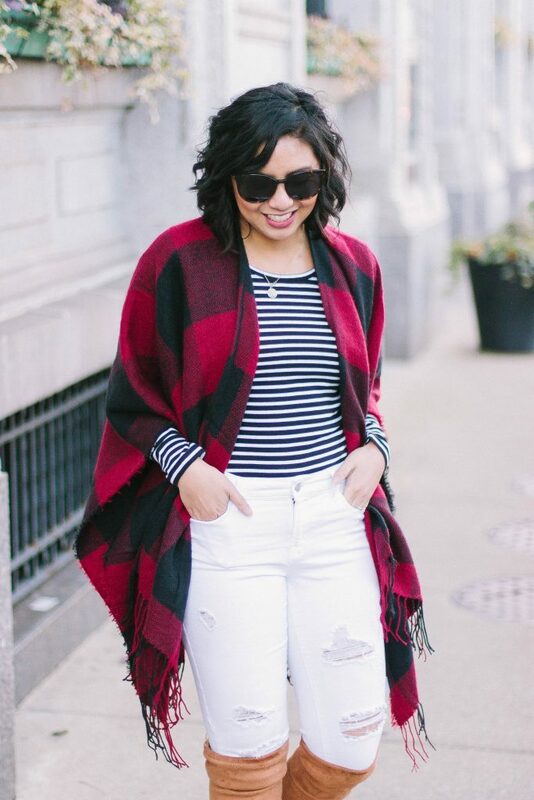 This piece is so super cozy and definitely lends a festive vibe- so cute, babe! I love buffalo plaid anything!! It’s so cute for everyday looks AND the holidays! You have such a great smile! 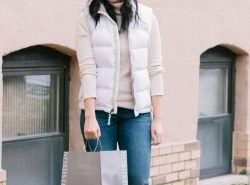 I actually think it’s easier to dress up than down and I LOVE this idea – such a great option for the season!!! 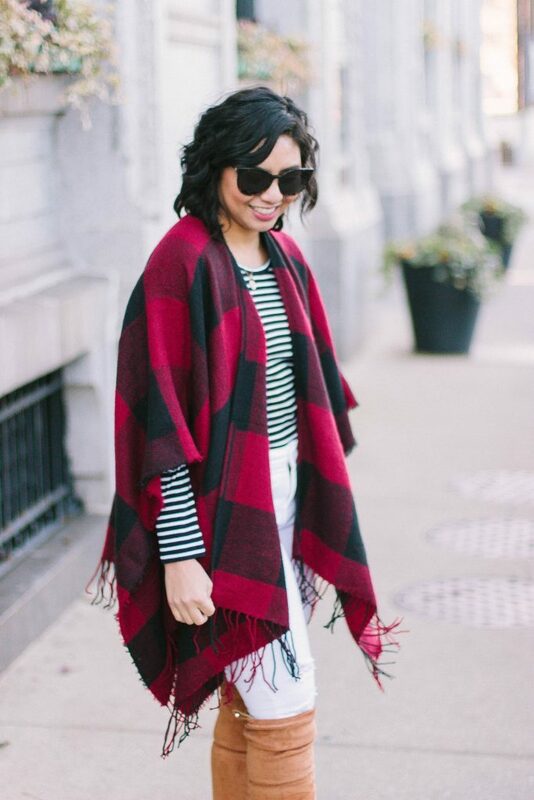 Buffalo plaid with the strips – sign me up! 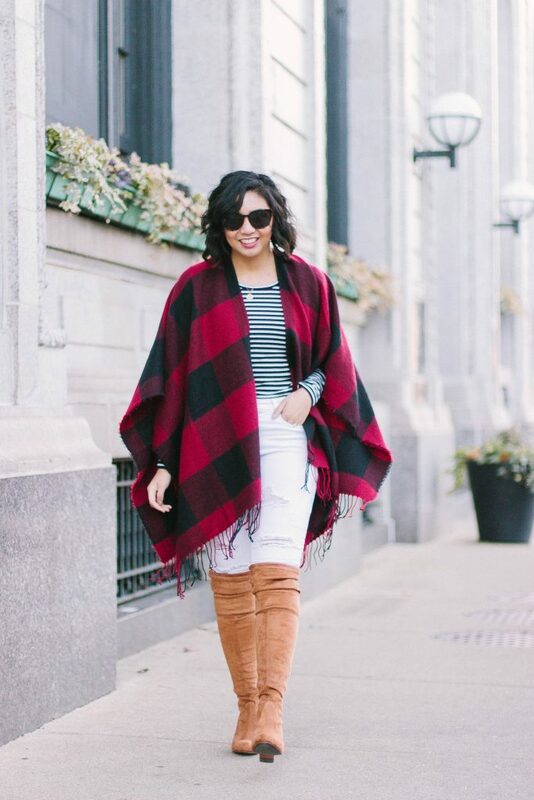 Love, love this look for the holidays and all winter! Gorgeous boots. I have always been a huge fan of Ponchos. Reminds me of west inspired looks. Great look! Elegant and cosy! Love buffalo plaid for the holidays! So festive! This is such a cute outfit! the Poncho is really great for the season too. That looks super cozy! I love buffalo plaids for the winter time. This is print-mixing at its finest – love the combo! 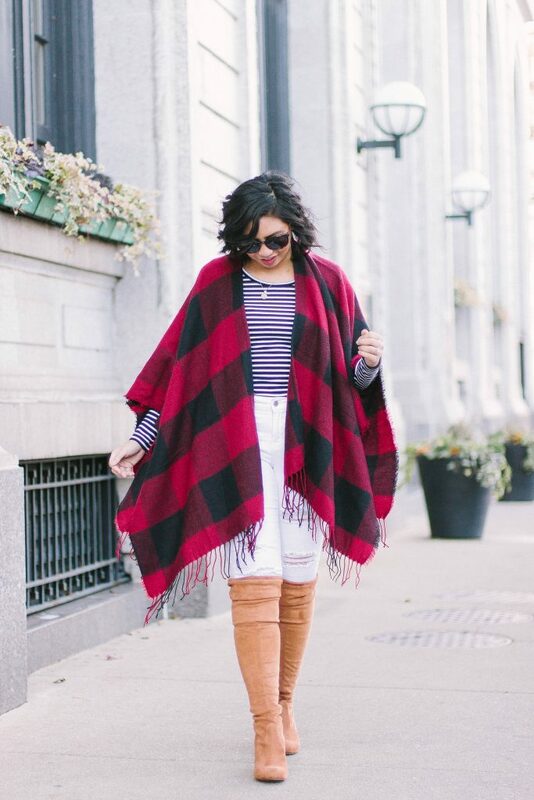 There really is something holiday-like about buffalo plaid! It looks so cozy and cute! I adore your poncho and I especially love the subtle print-mixing with the striped shirt! 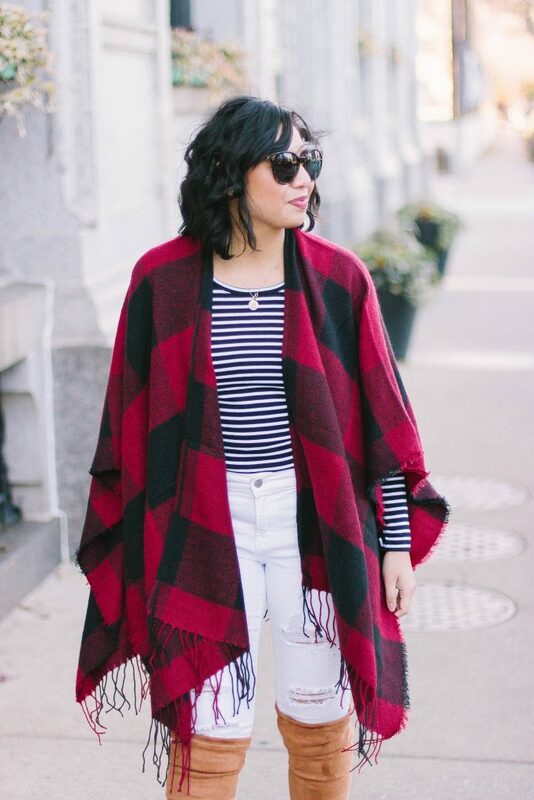 Love that buffalo plaid poncho! You look so gorgeous girl. OMG what a beautiful outfit, Rach! Love those poncho! Amazing color and texture!